This course is intended for senior undergraduates and masters level students in international business. Its purpose is to familiarize participants with the theories and practices of international finance as well issues of current interest. The program consists of lectures, case studies, exercises and simulations. Ample use is made of mathematical approaches. Case studies will be prepared and presented orally by groups of students. Opportunities are offered to participate in simulations of currency trading and of international portfolio management. Students will frequently be assigned exercises to prepare for the next class. This link is to sample exercises and answers. Trace briefly the history of any major international exchange; identify its method of trading and trading capacity and actual trading volumes; identify the number of days of delay between the recording of trades and their settlement. Sovereign Debt Restructuring: New Articles, New Contracts - or No Change? Which country or group of countries has the most voting power within the IMF? 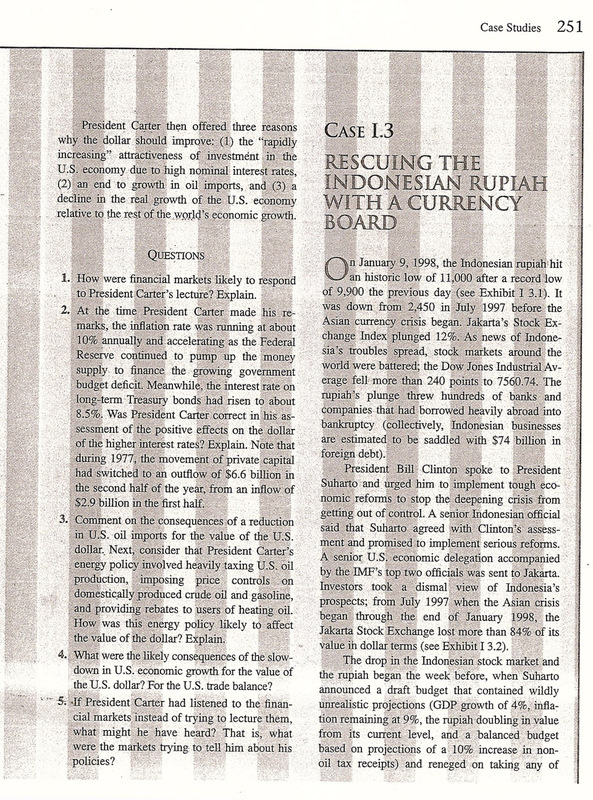 Identify another financial market crash, summarize its causes, its development and its resolution. Identify the winners and losers from the financial crisis in South Korea in 1997. Managing Exchange Rates: Achievement of Global Re-balancing or Evidence of Global Co-dependency? Should U.S. Investors Invest Overseas? IV.2 - Multinational Manufacturing Inc. Evaluation will be based on a written open book final exam (2 hours). The exam is oriented toward problem solving. Bonus points may be earned for class work (exercises, research, simulations, cases studies) and for participation in discussions. Students who choose to participate in either of the simulations will be given bonus points toward their final grades. Participation in the simulations is optional. Students who choose to participate should identify themselves to the professor. The US$/€/RMB exchange rates will be fixed at the start of the simulation. 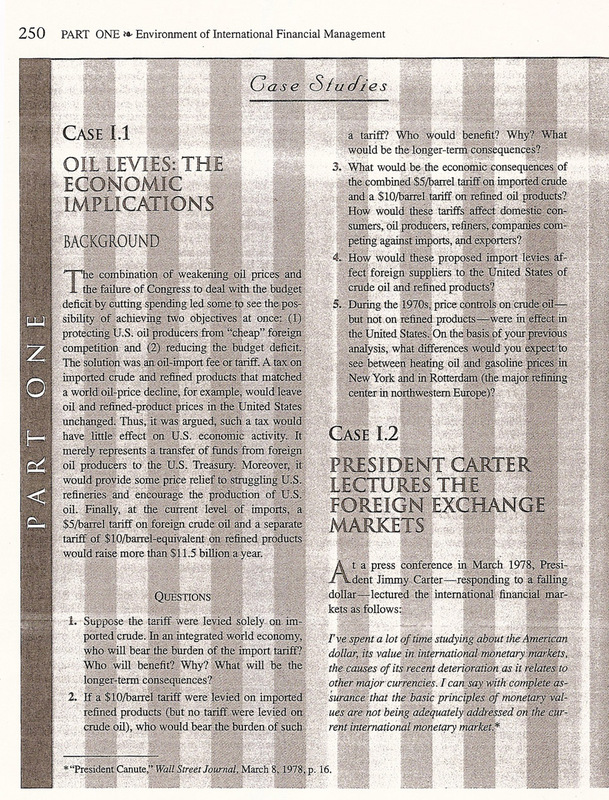 Participants will be asked at the outset to record an estimate of the exchange rates on the final day of the class on May 22, 2010. A question on the final exam will relate to the evolution of these exchange rates. Students will have the option of handing in on a regular basis their trades and recording their gains and losses as well as new sources of information that they may have collected on the exchange rate trends. Evaluation of the students' participation in the project will be based more on the efforts rendered and the lessons drawn than on the hypothetical gains or losses. Students may work on a simulation of a fund's hypothetical investment in China-related business.